An act to incorporate the town of Sharon in Weakley County was presented to the Tennessee state legislature, passed January 29, 1901 and approved February 6, 1901.The bank of Sharon is located at the corner of South Houas and Main Street. The first day of business was December 1, 1902. The town of Sharon really got its beginning and started to grow when the Illinois central railroad bought the right-of-way for its tracks through this settlement. The first train came through on August 22, 1873. A dance was held in the depot to celebrate. The name Sharon was chosen because the first train through the town had as its engineer a man named Sharon. The old lodge hall faced the railroad and the upstairs was used by the masonic lodge for many years. A local undertaker stored caskets downstairs. Parrish store was a thriving business. At the general store they sold everything from hardware to millinery. Downtown: Parrish store, Shannon’s drug store, Sharon Library, Moore Bros., Allen Dry Goods, General Store, Harkey Hardware, Frozen Food Locker, Post Office, Grocery Stores, Sharon Laundry, Bank of Sharon, Farmers Bank, Ford Agency, Thelma's Dress Shop, Trout's Grocery and Undertaker, and other fine stores. The downtown also had restaurants, livery stables, variety stores, barber shops, a skating rink and a bowling lane. Sharon high school: the school went to a four-year high school in 1914. Our school was noted as 'an institution of distinction.' in February 1924 disaster struck when the school building burned to the ground. Construction on the new building was begun almost immediately. The fire on October 14, 1968 spelled the beginning of the end of Sharon high school the high school years from 1970 until the fall of 1982 were different with Sharon teenagers being bussed from the local campus to martin Westview. With the teamwork of our county commissioners, school board members, Sharon city board and the local voters approving an additional sales tax on august 23, 1982, Sharon high school reopened. Hungry? 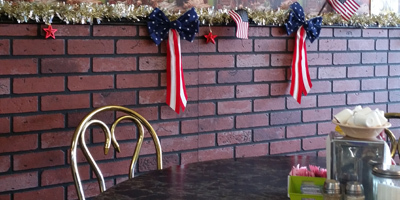 Open from 6:00 a.m. until 9:00 p.m. six days each week, Shelton’s Restaurant is the all American dining experience. From hand cut steaks to American pond raised catfish, there is something to delight everyone in the family at Shelton’s Restaurant – family owned and operated since 2010. Craving breakfast? Get breakfast any time of the day or night at Shelton’s! Check out their daily specials, delicious pasta menu, and ask your server about Shelton’s “Secret Menu” that contains house favorite items – like the “Hillbilly Philly” – that are not listed on the menu. Have an event that you need catered? Call Shelton’s for your catering needs. Shelton’s Restaurant in Sharon is your destination for great food, great family atmosphere, and great service! In business since 1974, Sharon Furniture and Appliance is family owned and operated by David and Maria Lackey. A General Electric [GE] exclusive seller, you’ll find every manner of trusted GE brand appliance to suit your needs including washers and dryers, dishwashers, refrigerators, stoves, garbage disposals, trash compactors, ice makers, microwaves, and more. If you are browsing for furniture, find a beautiful assortment of home furnishings such as beds, couches, table and chair sets, and Tiffany style lamps in trusted brand names such as Vaughan Bassett and Catrapper. Purchase your appliances from a family who will sell your appliance as well as service it, should the need ever arise. That’s the Sharon Furniture and Appliance guarantee: “We service what we sell.” Call them or stop by to visit the Lackey Family at Sharon Furniture and Appliance in downtown Sharon. et in downtown Sharon, Tracy’s Place Salon & Galleria is a one-of-a-kind shop and salon experience. The Galleria is an upscale consignment arrangement that features unique gift items, beautiful antique pieces, fiesta ware, standout glassware, extraordinary furniture pieces, cards and holiday items, home décor for every room, and all occasion selections for everyone in the family. Tracy’s Place Salon is a full service salon featuring two experienced, talented stylists, Tracy Mansfield Eddings and Melissa Edwards. Boasting over 50 years of combined experience, Tracy and Melissa are happy to provide style consultations to best assist customers with style needs. Call them today: 731-456-2655. If you are in need of a real diner experience, there’s a table waiting for you at Gayle’s Snack Shop in downtown Sharon! From 100% all beef hand patted diner-style grilled burgers, to a full service breakfast, Gayle’s Snack Shop is your destination for delicious food in a relaxed, family atmosphere. Try one of the local favorites: Grandpaw Cheeseburger, Grandmaw Hamburger, the popular “Slop & Mop”, or try one of Gayle’s tasty daily plate lunch specials. The menu is loaded with diner style favorites including homemade soup and grilled cheese and homemade pies. Did we mention the super reasonable menu prices? Come find out for yourself at Gayle’s Snack Shop only in downtown Sharon.